This is one of the nerve-centres of London. 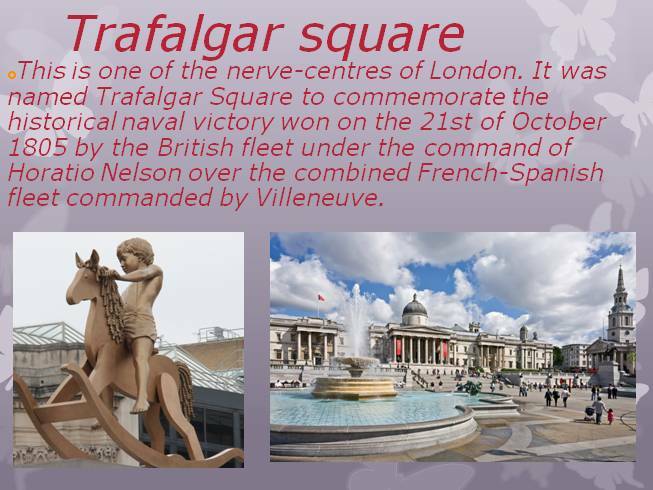 It was named Trafalgar Square to commemorate the historical naval victory won on the 21st of October 1805 by the British fleet under the command of Horatio Nelson over the combined French-Spanish fleet commanded by Villeneuve. The battle took place at Cape Trafalgar in the mouth of the Straits of Gibraltar and lasted several hours. 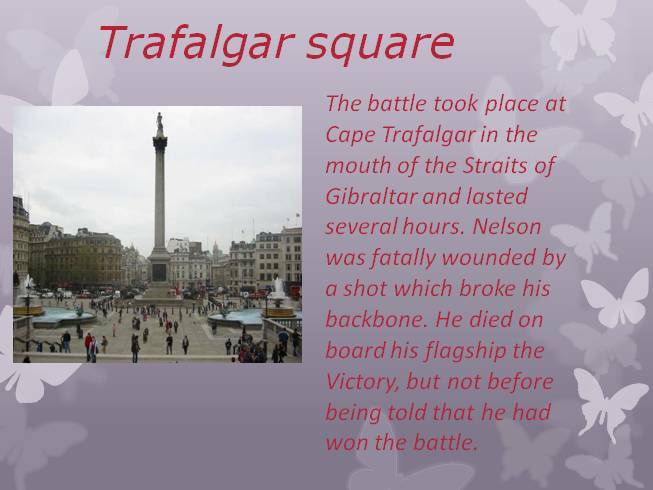 Nelson was fatally wounded by a shot which broke his backbone. He died on board his flagship the Victory, but not before being told that he had won the battle. 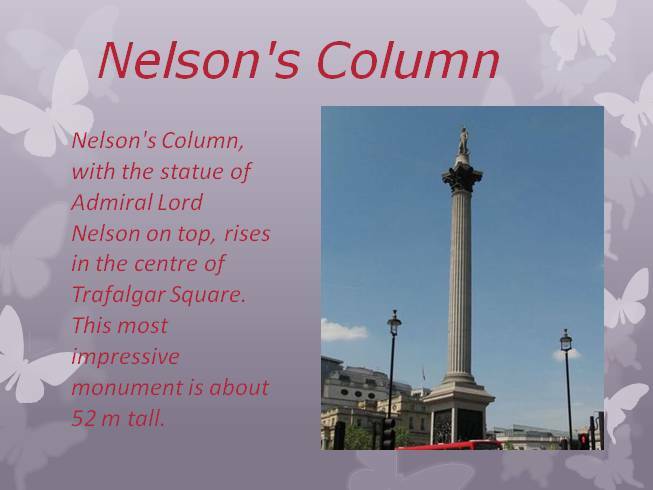 Nelson's Column, with the statue of Admiral Lord Nelson on top, rises in the centre of Trafalgar Square. This most impressive monument is about 52 m tall. 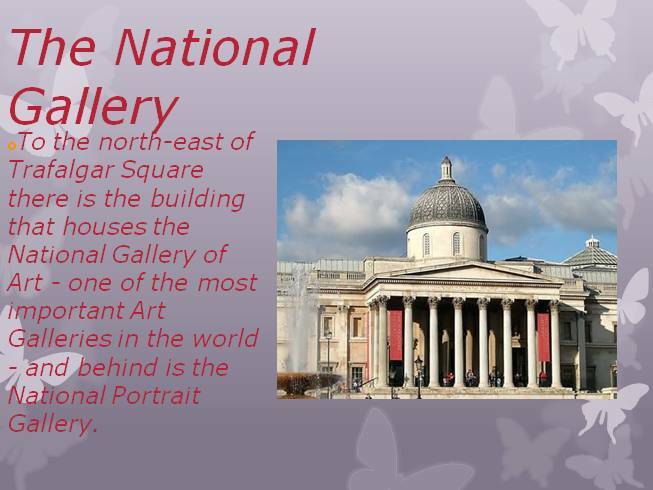 To the north-east of Trafalgar Square there is the building that houses the National Gallery of Art - one of the most important Art Galleries in the world - and behind is the National Portrait Gallery. Quite often the square becomes the location for meetings and in it crowds of Londoners congregate to celebrate political rallies. 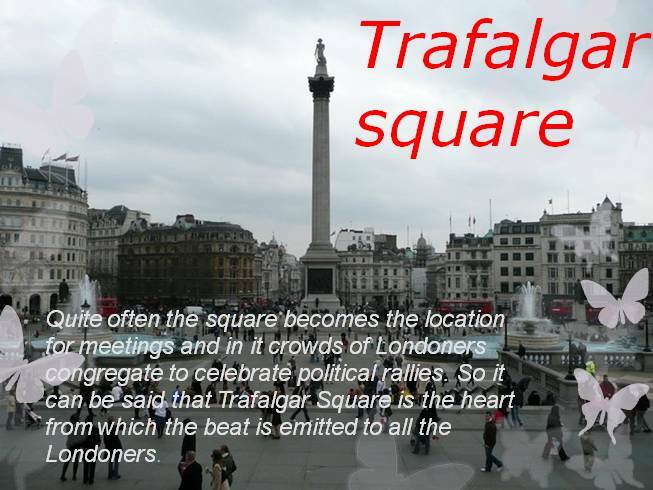 So it can be said that Trafalgar Square is the heart from which the beat is emitted to all the Londoners. 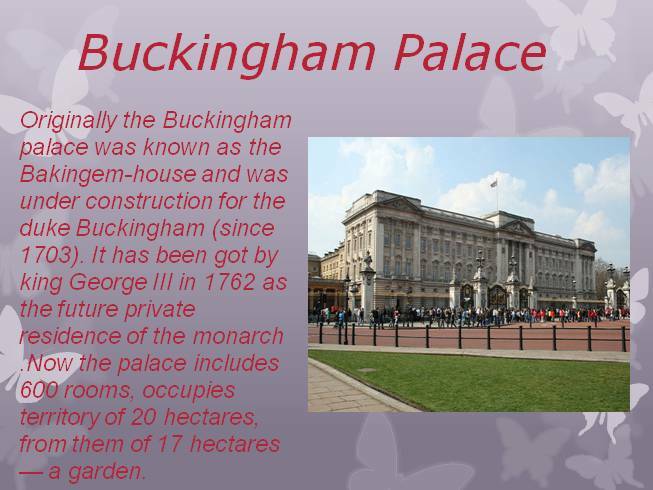 Originally the Buckingham palace was known as the Bakingem-house and was under construction for the duke Buckingham (since 1703). It has been got by king George III in 1762 as the future private residence of the monarch .Now the palace includes 600 rooms, occupies territory of 20 hectares, from them of 17 hectares — a garden. 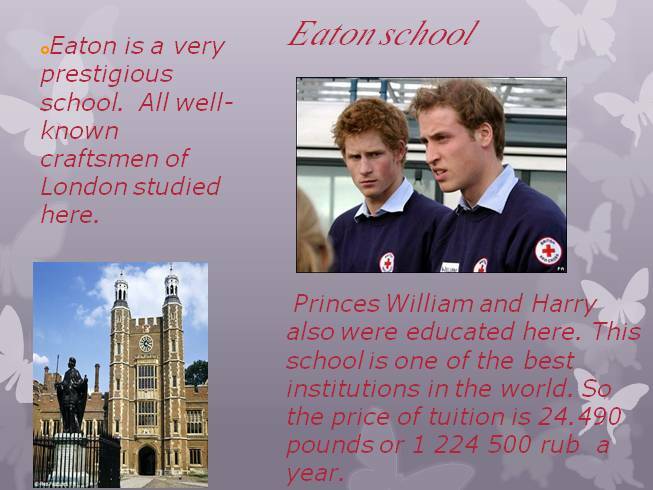 Eton College, usually referred to as Eton, is a British independent boarding school located in Eton, near Windsor in England. 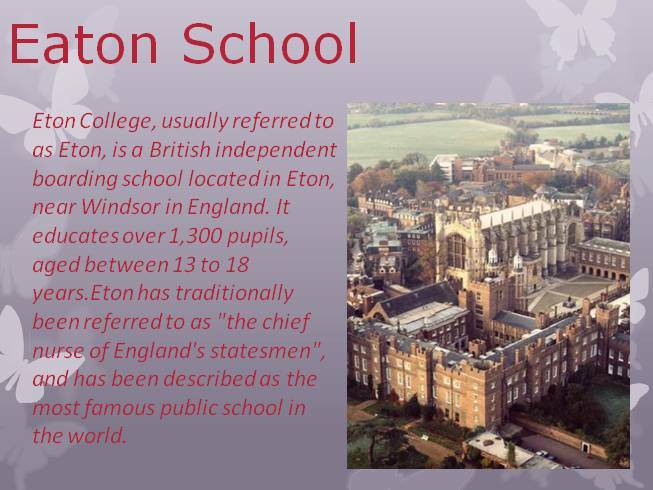 It educates over 1,300 pupils, aged between 13 to 18 years.Eton has traditionally been referred to as "the chief nurse of England's statesmen", and has been described as the most famous public school in the world. 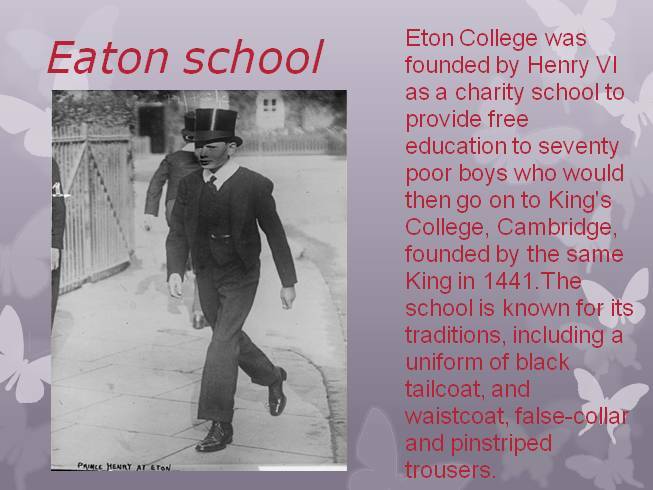 Eton College was founded by Henry VI as a charity school to provide free education to seventy poor boys who would then go on to King's College, Cambridge, founded by the same King in 1441.The school is known for its traditions, including a uniform of black tailcoat, and waistcoat, false-collar and pinstriped trousers. Eaton is a very prestigious school. All well-known craftsmen of London studied here. 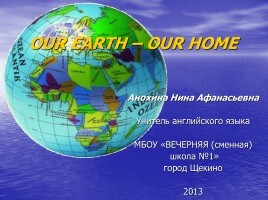 Princes William and Harry also were educated here. This school is one of the best institutions in the world. 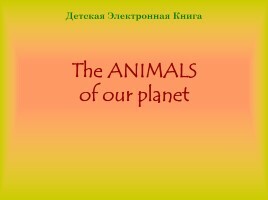 So the price of tuition is 24.490 pounds or 1 224 500 rub a year. The University of Oxford is the oldest university in the English-speaking world, and the second-oldest surviving university in the world. 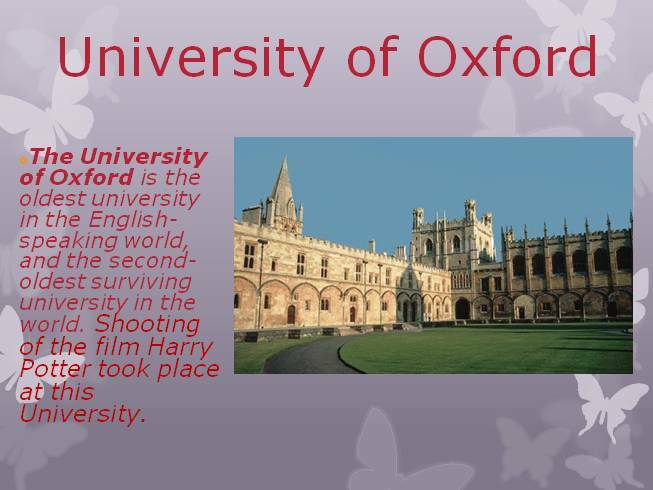 Shooting of the film Harry Potter took place at this University. 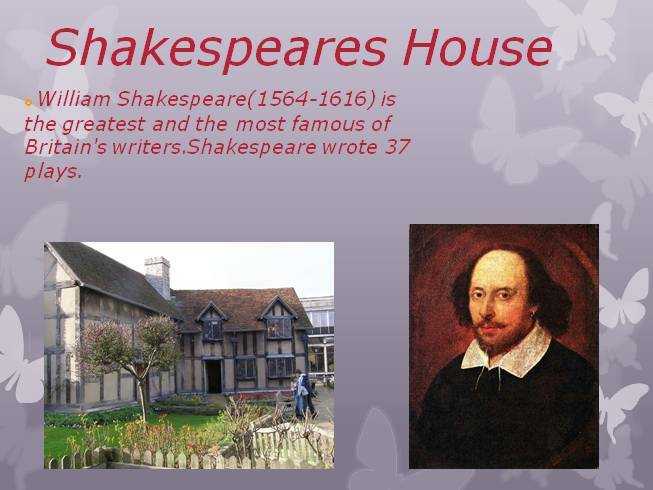 William Shakespeare(1564-1616) is the greatest and the most famous of Britain's writers.Shakespeare wrote 37 plays. 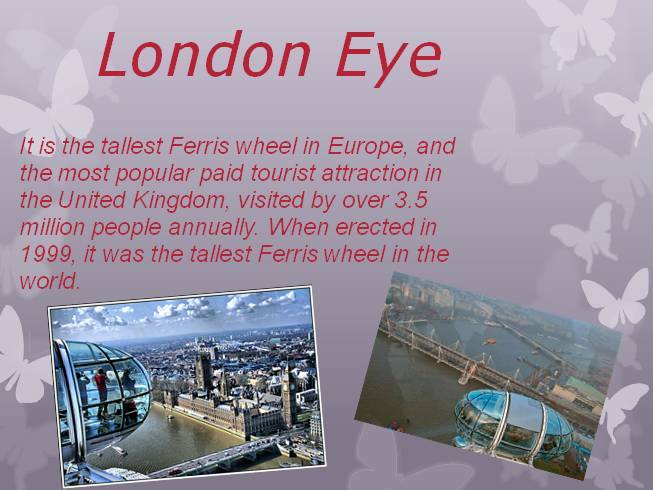 The London Eye is a giant Ferris wheel situated on the bank of the River Thames, in London, England. 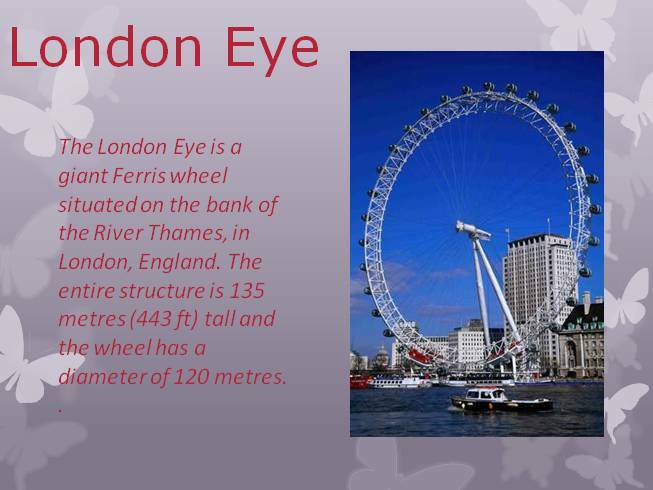 The entire structure is 135 metres (443 ft) tall and the wheel has a diameter of 120 metres. . 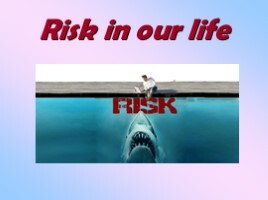 It is the tallest Ferris wheel in Europe, and the most popular paid tourist attraction in the United Kingdom, visited by over 3.5 million people annually. 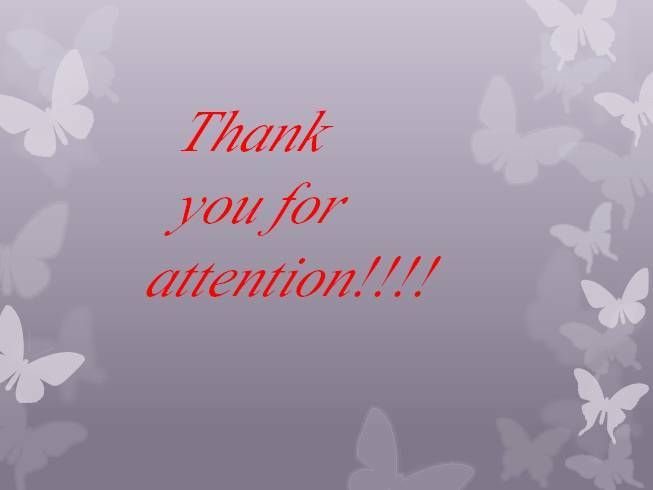 When erected in 1999, it was the tallest Ferris wheel in the world. 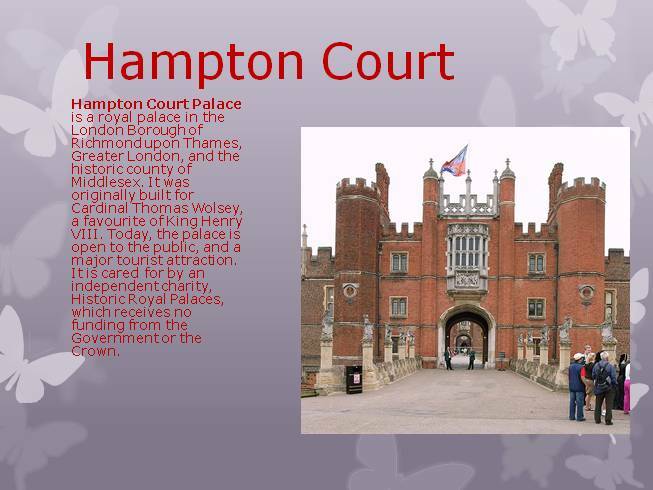 Hampton Court Palace is a royal palace in the London Borough of Richmond upon Thames, Greater London, and the historic county of Middlesex. It was originally built for Cardinal Thomas Wolsey, a favourite of King Henry VIII. Today, the palace is open to the public, and a major tourist attraction. 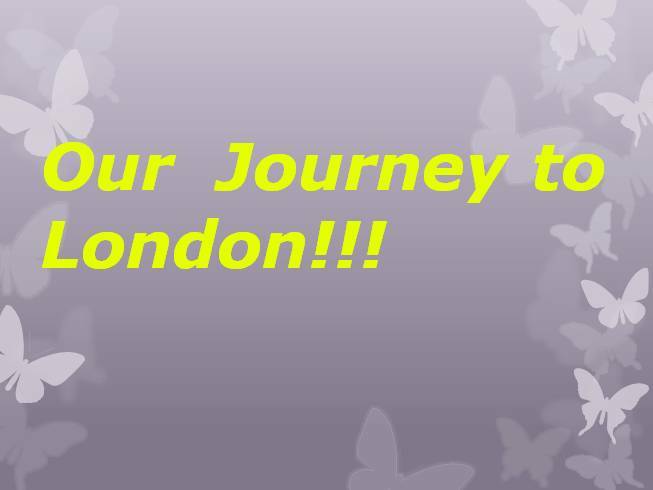 It is cared for by an independent charity, Historic Royal Palaces, which receives no funding from the Government or the Crown.